A multiuser multiple-input multiple-output (MIMO) downlink communication system is analyzed in a Rayleigh fading environment. The approximate closed-form expressions for the probability density function (PDF) of the signal-to-leakage ratio (SLR), its average, and the outage probability have been derived in terms of the transmit beamformer weight vector. With the help of some conservative derivations, it has been shown that the transmit beamformer which maximizes the average SLR also minimizes the outage probability of the SLR. Computer simulations are carried out to compare the theoretical and simulation results for the channels whose spatial correlations are modeled with different methods. The capacity of a wireless cellular system is limited by the mutual interference among simultaneous users. Using multiple antenna systems, and in particular, the adaptive beamforming, this problem can be minimized, and the system capacity can be improved. In recent years, the optimum downlink beamforming problem (including power control) has been extensively studied in [1–3] where the signal-to-interference-plus-noise ratio (SINR) is used as a quality of service (QoS) criterion. After it has been found that the multiple-input multiple-output (MIMO) techniques significantly enhance the performance of wireless communication systems [4, 5], the joint optimization of the transmit and receive beamformers  has also been investigated for MIMO systems. Motivated by the fact that the optimum transmit beamformers [1–3] and the joint optimum transmit-receive beamformers  can be obtained only iteratively due to the coupled nature of the corresponding optimization problems, recently, the concept of leakage and subsequently the signal-to-leakage-plus-noise ratio (SLNR) as a figure of merit have been introduced in [7, 8]. (Note that SLNR as a performance criterion has been considered in [9–11] for multiple-input-single-output (MISO) systems.) Although the latter approach only gives suboptimum solutions, it leads to a decoupled optimization problem and admits closed-form solutions for downlink beamforming in multiuser MIMO systems. While investigating multiuser systems from a system level perspective, in many cases, the outage probability has also been widely used as a QoS parameter. The closed-form expressions of the outage probability with equal gain and optimum combining have been derived in [12, 13], respectively, in a flat-fading Rayleigh environment with cochannel interference. The latter work has been extended in  to a Rician-Rayleigh environment where the desired signal and interferers are subject to Rician and Rayleigh fading, respectively. However, in all of the above-mentioned papers, investigations have been limited to the derivations of the outage probability expressions for specific types of receivers. The outage probability of the signal-to-interference ratio is used to formulate the optimum power control problem for interference limited wireless systems in [15, 16] where the total transmit power is minimized subject to outage probability constraints. However, both of the these works [15, 16] are limited to systems with single antenna at transmitters and receivers. In this paper, we consider the downlink of a multiuser MIMO wireless communication system in a Rayleigh fading environment. The base station (BS) communicates with several cochannel users in the same time and frequency slots. In our method, we use the average signal-to-leakage ratio (SLR) and the outage probability of SLR as performance metrics which are based on the concept of leakage power [7, 8]. 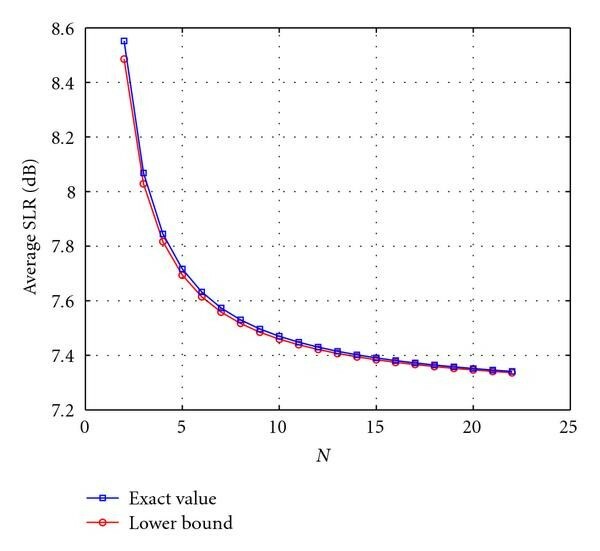 In particular, the novelty of our work lies on the facts that we first derive an approximation of the statistical distribution of SLR  for each cochannel user of the MIMO system in terms of transmit beamforming weight vector. Second, the approximate closed-form expression for the outage probability of SLR is derived. Then, we obtain the solution for the transmit beamformer that minimizes the aforementioned outage probability. According to our best source of knowledge, this approach has not been previously considered for the multiuser MIMO downlink beamforming. With some conservative derivations, we also demonstrate that the beamformer which minimizes the outage probability is same as the one which maximizes the average SLR. Note that similar conclusion has been made in  where the downlink beamforming for multiuser MISO systems is analyzed using the SINR and its outage probability as the performance criteria. In contrast to , we consider that the BS has only the knowledge of the second-order statistics such as the covariance matrix of the downlink user-channels. The motivation behind this assumption is that the knowledge of instantaneous channel information can be available at the BS only through the feedback from users. The drawbacks of the feedback approach are the reduction of the system capacity because of the frequent channel usage required for the transmission of the feedback information from users to the BS, and inherent time delays, errors, and extra costs associated with such a feedback. Furthermore, if the channel varies rapidly, it is not reasonable to acquire the instantaneous feedback at the transmitter, because the optimal transmitter designed on the basis of previously acquired information becomes outdated quickly (see  and the references therein). Thus, we consider that no full-rate feedback information is available at the BS. The remainder of this paper is organized as follows. The system model is presented in Section 2. The probability density function (PDF) of SLR, its mean, and the outage probability of SLR are derived in terms of the beamformer weight vector in Section 3. In Section 4, the transmit beamformer which maximizes the average SLR and minimizes the outage probability is obtained. In Section 5, analytical and numerical results are compared. Finally, conclusions are drawn in Section 6. Upper (lower) bold face letters will be used for matrices (vectors); , , , , and denote the Hermitian transpose, mathematical expectation, identity matrix, Euclidean norm, trace operator, and the space of matrices with complex entries, respectively. It is considered that the transmitter (also the BS) does not know user's receiver, and thus, the SINR (5) is not available at the transmitter. In this case, the transmitter optimizes its beamforming vector to maximize the SLNR (3) thereby assisting the user's receiver in its task of improving the SINR (5). The latter fact can be verified numerically. Note that the beamformer based on maximization of (3) can also be designed for the cases where only the knowledge of second-order statistics of downlink channels is available at the BS. In such cases, the advantages are twofold; the BS and receivers can work in a distributed manner (since the criterion is SLNR), and the BS needs only a limited feedback information from the receivers. To facilitate the aforementioned scheme, we first analyze the statistics of SLNR (3) in the following section. where is the total number of subcarriers, is the number of independently fading channel-taps, and is the impulse response for th tap of the channel between th receive and th transmit antenna. If are ZMCSCG, it is very easy to note that is a ZMCSCG. Furthermore, if the average sum of the tap-powers for the channel between the th receive and th transmit antennas is same, that is, if for all , after some straightforward steps, we can easily verify that the distribution of remains complex Wishart with the same scaling matrix and the degrees of freedom parameter . This shows that the statistics of the signal and leakage powers for a given subcarrier and user remain unchanged. In this section, our objective is to find the optimum which maximizes the average SLR and minimizes the outage probability of the SLR observed by th user. Note that due to the fact that we use the average SLR and SLR outage as the criteria, the beamformer design is a decoupled problem and can be carried out separately for each user. Thus, the optimum weight vector is the eigenvector associated with the largest eigenvalue (generalized eigenvalue problem) of the characteristic equation given by (32). Later, our numerical results confirm the tightness of the lower bound (31) of average SLR for the weight obtained from (32). which is also in the familiar Rayleigh quotient form. (Since we replace the exact cost function by its upper bound, the minimization problem becomes independent of .) With the help of Lagrangian multiplier method, we can show that the optimum weight vector that minimizes (37) is given by (32) which is just the solution of the transmit beamformer that maximizes the average SLR. Hence, it is clear from (32) that the minimum outage probability and maximum average SLR transmit beamformer require only the knowledge of correlation matrices and average channel power gains. We will later demonstrate, with the numerical results, that the upper bounds in (35), (28), and (36) are relatively tight for the beamformer weight derived from (32). In this section, we first verify the correctness of the analytically derived PDF (17) of SLR by comparing the analytical results with the Monte-Carlo simulation results. Next, we investigate the tightness of the bounds in (29) and (36). The outage probability of SLR for the th user (for conciseness, the results are shown for ) obtained via theory (23) and Monte-Carlo simulations are also shown for different parameters and correlation models. However, these results are not intended to illustrate the outage performance of a particular system. This would require additional assumptions regarding power control, modulation, and channel coding. Finally, we also demonstrate that the maximum average SLR or minimum outage probability transmit beamformer also helps to significantly improve the user SINR when the user employs linear operation such as matched filtering. We consider MIMO channels in which the transmit correlations are modeled with two different methods; exponential correlation and Gaussian angle of arrival (AoA) models. Throughout all examples, we take , , , , , and . Note that this is purely by way of example, and other values could just have easily been considered. The outage probability of SLR is presented using Monte-Carlo simulation runs during which the channels ( change independently and randomly. For each channel realization, the SLR for th user is computed and compared with the threshold value for determining the outage probability. where represent the th row and th column of , are the amplitudes of correlation coefficients and is the AoA of the plane wave from the th point source. 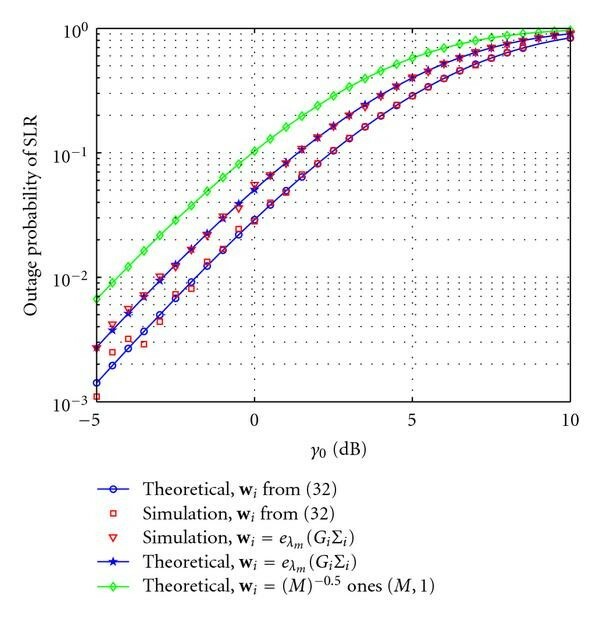 The analytically obtained PDF (17) of SLR is compared with the simulation results as shown in Figure 2. In this figure, the beamformer weights are optimized according to (32) for the exponential correlation model (38). It can be observed from Figure 2 that the analytical and simulation results are in fine agreement, and hence the accuracy of the derived PDF of SLR is validated. Figure 3 displays the analytical and simulated outage probabilities of SLR versus for (a) the optimized from (32), (b) the non-optimized ( ), and (c) which is the eigenvector corresponding to the maximum eigenvalue of . Note that the last method simply tries to maximize the signal power toward the user of interest without even trying to suppress the leakage power toward the other users. Although this approach is highly suboptimal, it is very simple to implement, and its performance can be encouraging especially in UMTS cellular networks  where, due to downlink omnidirectional strong common pilot channels, the overall leakage power appears to be almost white noise. As expected, it can be observed from Figure 3 that the method (32) outperforms the other two cases. The theoretical and numerical results for different values of and are compared in Figure 4. In Figures 2 and 3, we take and in Figures 2, 3, and 4 we take , , , and . Comparison of analytical and simulated PDFs of SLR ( is obtained from (32), and the exponential correlation model is used). Comparison of outage probablity with different weight vectors as a function of for user (exponential correlation model). 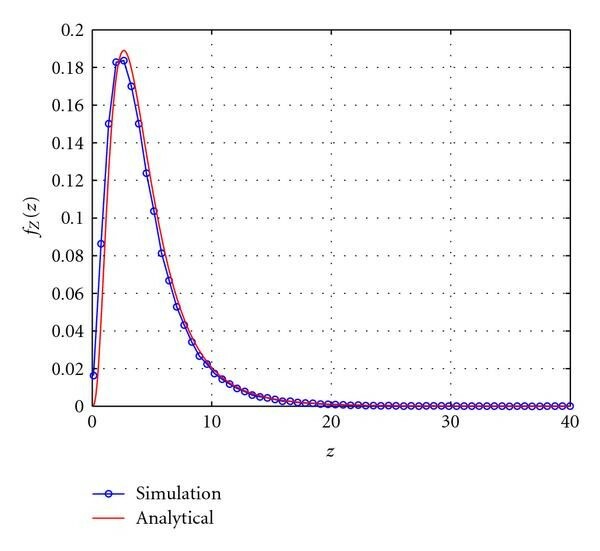 Comparison of theoretical and simulated outage probability as a function of for the user (exponential correlation model). where is the central angle of the incoming rays to the BS from the th user. We assume that the first user is located at relative to the BS array broadside, and the other two users are located at where we take (except in Figure 6 where is varied) and for all . The exact average SLR (27) and its lower bound (31) both versus are compared in Figure 5 where the optimum weight vector is chosen according to (32). We take for this figure. It can be seen from Figure 5, that the difference between the exact values of the average SLR and its lower bound is almost negligible for all which in fact confirms that the beamformer (32) maximizes the average SLR with a very fine accuracy. The exact functions in (28) and (35), their corresponding upper bounds, the sum function (36) (with ), and its upper bound are displayed in Figure 6 for different values of where the beamformer is derived from (32). It can be observed from this figure that the bound in (28) is very tight for all values of whereas that in (35) is tight for the medium and larger values of . In fact, the gap between the overall exact function (36) and its upper bound is sufficiently small for all values of . 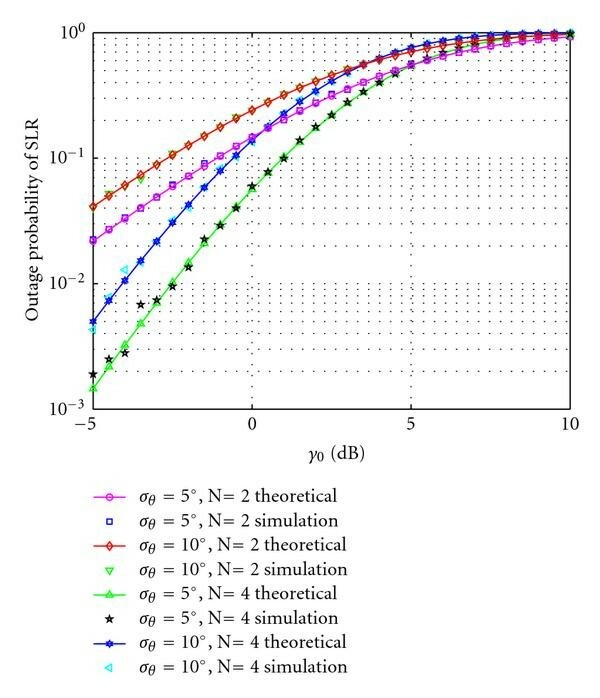 Figure 7 shows the outage probability of SLR versus obtained via theory and simulations for different values of and . The average SINR (5) and the average SLNR (3) of th user versus the receiver noise power are displayed in Figure 8 again for (a) the optimized of (32), (b) the non-optimized ( ), and (c) which is the eigenvector corresponding to the maximum eigenvalue of . 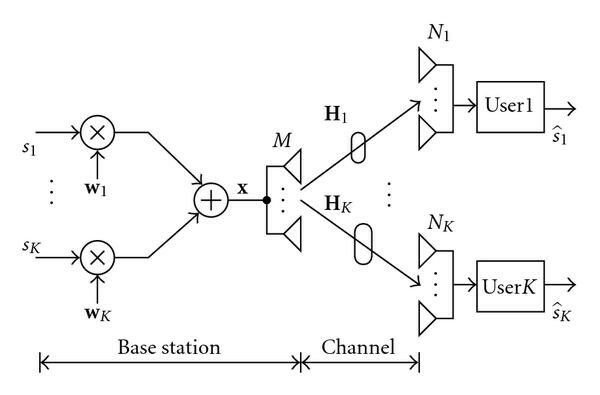 In this figure, the SINR and SLNR are averaged over independent channel realizations, and it is considered that the receiver has perfect knowledge of instantaneous channels. It can be seen from Figure 8 that the transmit beamformer (32) based on maximization of SLR significantly helps to improve the receiver's SINR. Figures 3, 4, and 7 display that the matching between the theoretical and simulation results is very fine. This confirms the validity of the proposed theoretical expression for outage probability. It can be noticed (see Figures 3 and 8) that the beamformer, which tries to suppress the leakage power while maximizing the signal power (32), is better than the one which only maximizes the signal power of the user of interest by neglecting the leakage power (method (c). 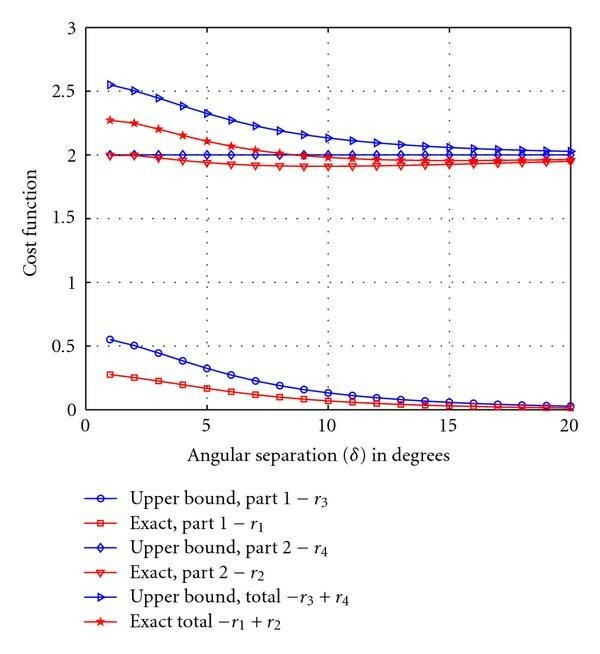 The results (Figures 4 and 7) also show that as the spatial correlation between the antenna elements increases (correlation coefficient increases or angular spreading decreases), the outage probability decreases. The latter observation can be explained from the fact that when the spatial correlation increases, the ranks of MIMO channels decrease, thereby allowing the beamformer to perform better. The best performance can even be obtained when the MIMO channels are fully correlated ( i.e., channels become rank one). It can be also observed (see Figures 4 and 7) that by increasing the BS antenna correlation, the performance can be improved more effectively than just by increasing the number of user antennas while keeping the BS antenna correlation sufficiently low. Furthermore, as expected in Figures 3, 4, and 7, the outage probability increases with increasing . Exact average SLR and its lower bound in (31) as a function of for the user ( is obtained from (32), and Gaussian AoA model is used). Exact cost function and its upper bound in (36) versus for the user ( is obtained from (32), and Gaussian AoA model is used, , , , and ). Comparison of theoretical and simulated outage probability as a function of for user ( is obtained from (32) and Gaussian AoA model is used). Average SINR and average SLNR versus noise power for the user (Gaussian AoA model with ). 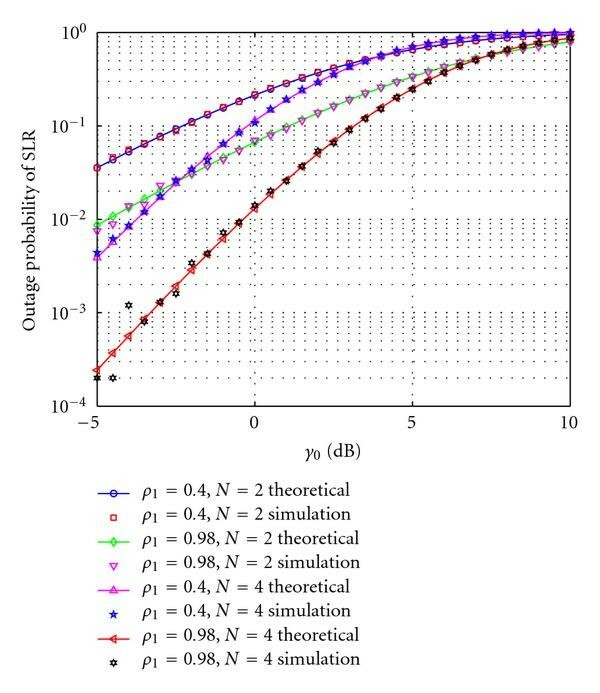 A fine agreement between the theoretical and simulation results for the PDF of SLR and its outage probability confirms the correctness of the proposed analysis for a multiuser MIMO downlink beamforming in a Rayleigh fading environment. The results also show that the spatial correlation between the antenna elements significantly helps to increase the performance of the SLR-based transmit beamformer in terms of the SLR outage probability. It has been found via some approximations that the transmit beamformer which maximizes the average SLR also minimizes the outage probability of the SLR.